Club Penguin Cheats by Mimo777 Club Penguin Cheats by Mimo777: May Pay Day... But Wait, I've Been Robbed! 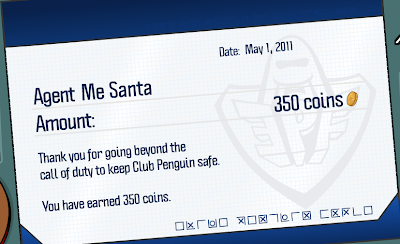 As you know, it's the first of the month, and that means it's Club Penguin PAYDAY! Woot! So, I go to my mail box and wha? I've been robbed! NO PAYCHECK! Wassup wit dat? Did you get your paycheck yet? I sure hope it comes soon! I got mine werid ? i dident get one maybe only non mebbers get it now? I got my pay check but mine said my CP name (Bluesky7112) I don't know what was up with yours. Thats cool huh? One problem i havent got my paychecks yet weird huh? Just to let you know mimo the Club Penguin sports catolog hasnt been upgraded for a long time. I Think Herbert was that! It's NOT HERE!!! I WANT MY MONEY CLUB PENGUIN!!!! These pay check pay all my membery buys!! i didn't get payed maybe i will soon . HOPEFULLY! guys cp made it only for non members. Members dont need it because they get more levels in games. 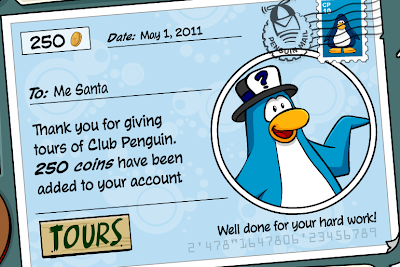 thats actually quicte wrong, I got my pay check and Im a member, plus non-members dont need that many coins, plus it may just be a glitch. I also dont say that what you think is wrong, my opinion might be wrong too.